Queal is working on a new bag design and THIS is what it will look like! 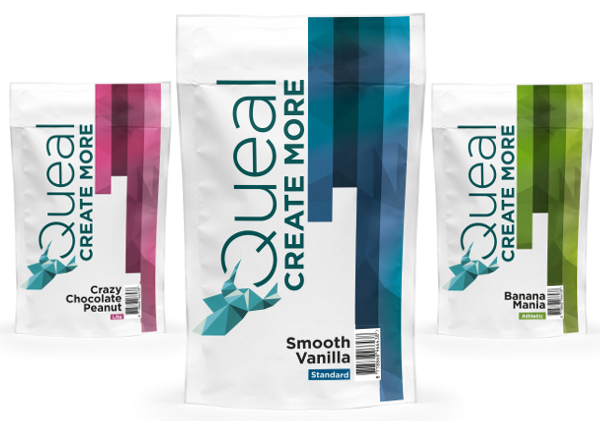 Our fully printed, brand new Queal-bags will show up before 2017 and come with nutritional information as well as showcase an updated branding look and feel to Queal! What do you think of the new design and colors? Great! Way to go Queal! I think I'll finish my remaining bags extra fast so I can order this new, AWESOME, design! Are they available yet? Not yet! We expect to have them arriving at customer's doorsteps sometime in December. I like the design, but hate the new bags. I preferred the ripcord on the side of the older bag, it was cleaner and easier to open. The new ones are also too narrow, I struggle to get my big hands into the bag now. Hi @edkorho, I'm sorry to hear that it's a struggle to use the new pouches. Thank you for letting us know! I didn't saw previous version, but I like current design, it's awesome. But if we talk about usability, it's not very good, I prefer, if it opens on longest side, but it requires longest zipper => cost increase, or scoop with long handle, to avoid powder on hands, it's can be critical, when you go for a long walk and attempt do some queal for you. And I will also like, if there appears bulk package with meals for 1 week for example. In same print design ofc. The new design looks great, love all the information on the back of it too. The only problem now is the sealing mechanism, it's not strong at all. All of the bags arrive with the air seal already opened and when resealed it only take a small tap to reopen the bag. This makes it very difficult to store them after opening as they open up with just regular handling. I also agree with @edkorho in that the ripcord was easier to open. The art design is fantastic, would be perfect with the old style of bag! The resealable part is open, but you still have to tear the foil to expose the powder to outside air. The real problem is resealing them, they reopen very easily. Hi @Roe and @srjuanjo! It is correct that the inner sealer mechanism could be open when it arrives. But the bag itself is heat sealed, so that means that no powder will be spoiled or will be decreased in quality. The design of the bags is very nice, I like that they are so fresh looking. I know this is not a new feature, but I really enjoy the bag size. Being able to just throw an unopened bag in my handbag without needing to transfer it into a tiny container is good. The seal on the bags is a little bit difficult to work with because some powder gets trapped inside the seal during shipping. Powder getting stuck in the ridges of the resealable line does indeed seem to be the main issue with the resealable part being difficult to close. For now, the easiest solution is to 'flick' the side of the bags with your finger a couple times to remove the powder, then it seals nicely. We're looking into improving the resealable line to be less susceptible to this problem. You gave up on the fully colored pouches? In my last order I got 2x Morning Macchiato, newer batch than last ones yet these were in 'old' bags..
No don't worry. We had a production delay of the bags, combined with a lower than expected stock of the printed pouches (due to a shipment to the USA), which left us with not enough bags at the end of 2017. So we had to produce a short run of some flavours (including Macchiato) in the old white 'Limited Edition' bags. We're back to fully printed pouches already, and are actually working on a new bag design coming in April or so! The design of the bags is wonderful. The functionality is terrible. None of the bags that I have purchased over the past year have been remotely "resealable". The ziplock simply does not lock. Very low-quality zip. I have taken to folding the pouch in half and pinching the top with a clothes peg. Not ideal, but it's all I can do to keep the humidity out. I also hate opening new bags. I tap and tap and tap the top before opening it, but I just know that powder is going to fly out all over the place when I rip the top of the bag off. Makes me dread opening new bags. But look, I'm still here and coming back for more. If you wanted to improve the quality of your pouches, this customer would be happier.